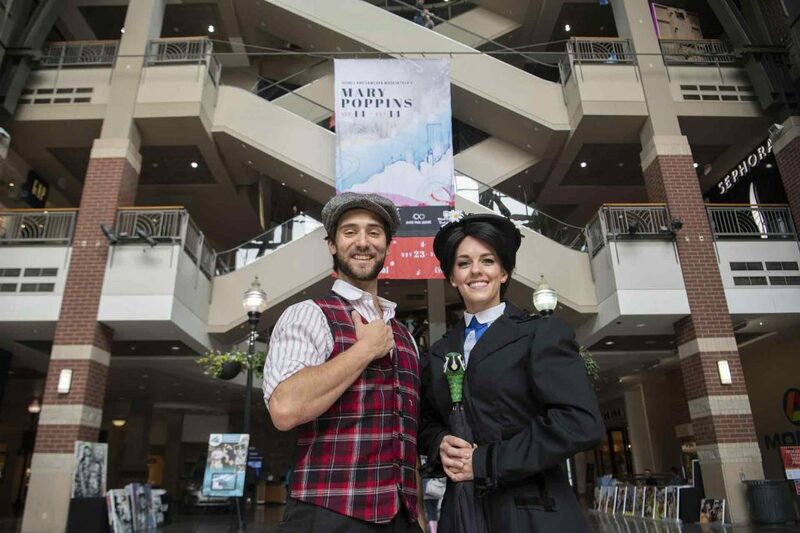 Spokane Civic Theatre’s production of Disney and Cameron Mackintosh’s “Mary Poppins” opened last weekend to uproarious support. You could feel the crowd impatiently anticipating. After a cheeky but unfortunately ignored plea from the P.A. system to silence all cellphones and enjoy the show, lights lowered over a hushed house. Introductory chords from the orchestra set the scene for Bert’s (Jerrod Galles) prologue. On walks Bert in his sooty work clothes. Galles’ lovable demeanor, singing voice and dancing throughout the show made up for any minor pitch problems. The audience is then introduced to the Banks household. Naughty siblings, Jane (Mia Kubicek) and Michael Banks (Eli Wissing) live in a respectable London home on Cherry Tree Lane with their mother (Alyssa Day) and father (Patrick McHenry-Kroetch). Also living in the home, we find Mrs. Brill (Lauralynn “Lulu” Stafford), the disgruntled cook, Robertson Ay (Nicholas Griep), the clumsy butler whose name could be a joke but it’s unclear, and Katie Nanna (Amy Dawson), the latest in a string of nannies forced to quit by the supposed unmanageability of the children. After Katie Nanna leaves in distress, the children present their parents with an ideal list of nanny characteristics. Mia and Eli delivered their “Perfect Nanny” list in an adorable duet. Eli was very sweet and quickly charmed the audience with his little boyishness. Mia was a star. Not only did she sing, act and dance well but she also had one of the most consistent accents in the cast, surpassed perhaps only by Mary Poppins (Quincy McCune) herself. McCune’s portrayal of Poppins was a joy to watch and hear. There were moments where her mannerisms were so accurate, and my seat just far enough back, that Julie Andrews could’ve been there on stage. Day was endearing as Mrs. Banks and had some incredible singing moments as she pitifully tries to pull together a tea party for people she doesn’t know instead of pursuing the acting career that, by all rights, she should have been allowed. McHenry-Kroetch, as Mr. Banks, goes from an angry “bad dad who makes the kids sad” to a sympathetic father who cares about his children at a fairly believable rate despite the short time he’s given to do so. In one memorable scene, the children are attempting to “help” the cook. The scene quickly devolves into a production of “the icing that goes wrong” during which the butler burns his hands and proceeds to bump into everything on stage until finally falling down. The time it took for him to fall definitely bordered on exceeding its funniness, but once he was on the ground, everything he did was hilarious. The “Spoonful of Sugar” scene that follows the icing catastrophe was delightful despite a few awkward blocking moments. Then, after an almost uplifting scene in the bank, the mood gets leveled out by “Feed the Birds.” The whole scene was strangely uncomfortable, and it’s unclear why. But what follows in “Supercalifragilisticexpialidocious” is reason enough to see the show. The choreography is impressive and watching everyone on stage nail the spelling section is just a blast. However, the scene’s energy level makes it seem like a natural first act finale. Instead, it’s followed by a couple transitional scenes and an excellently choreographed but nevertheless nightmarish toy scene that the children amazingly escape without any lasting repercussions or psychological traumas. After defeating the evil nanny replacement, Mary takes the children on a casual roof field trip at which point they’re greeted by “Step in Time,” the most thoroughly rehearsed dance number in the entire musical. The lyrics probably weren’t particularly important, but they were difficult to hear over the incredible tap routine that the cast pulled off to enthusiastic applause. This number also felt like a finale but was followed by several transitional scenes that finally tapered off into the bows. The costuming, set design and lighting worked well throughout the show and never distracted from the action of the musical. Everyone looked exactly like they should. The “conversation saleswoman” from “Supercal,” Mrs. Corry’s (Kristen Nauditt) costume was particularly exciting. The set design was pretty clever and scene changes weren’t too long. The flying was great overall but at times I found it much more funny than it was probably supposed to be. Mary Poppins would come down from the side to say to hello to Bert or the children briefly and then immediately bounce off stage again. I couldn’t stop thinking about the old DVD logo. Taking into account the fact that the cast is entirely made up of volunteers and amateur performers, the show was fun and everyone had a great time. There were exciting dance numbers, the singing was pretty good overall, and everyone had a few great moments. Jane (Mia) and Mary Poppins (McCune) deserve special recognition for the effort they put into their accents. Otherwise, the distracting inconsistency of the English accents did them all a real disservice and, seemingly, prevented several cast members from acting to the best of their ability. A few brief check-ins with a dialect coach was not sufficient support, and, frankly, the cast deserved more for all the other hard work they clearly put into creating this little piece of musical magic.